The months leading up to your move overseas to teach English abroad can be hectic, to say the very least. You'll be attending going away parties and making sure you say goodbye to everyone, packing up old apartments and office desks, and then of course, the most important item on the to-do list: shopping. Deciding what you actually need versus what you merely just kind of want can get tricky. So where should the money go? Should you splurge on an abundance of high-quality toiletries or a new raincoat? How about some wall décor and furniture to make your new apartment feel nice and homey? When preparing for your move abroad, be practical, be realistic, and make sure you’re familiar with the weather in your new home. 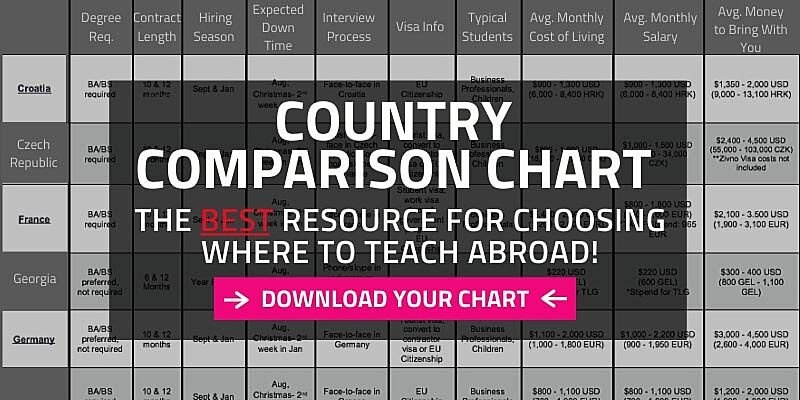 Here’s a list of items worth splurging for and some others you should pass on before you move abroad to teach English. Your phone camera is great but it’s not enough. I’m still kicking myself from the time I brought my iPhone to the Great Wall of China and it died halfway through the trek. Turns out the Great Wall doesn’t have any outlets, either. Spend the money and invest in a high-quality camera. Your family and friends will thank you for it, and they’ll also love stalking your photos online and following your journey through pictures. You’re right, the photos won’t do justice to the true beauty of Machu Picchu or the colorful, vibrant streets of Vietnam, but these images will bring you back to those moments and you’ll be grateful for the refresher. I can proudly say that before I moved abroad, I’d never previously owned a raincoat. I was always that person with the dollar store umbrella that snapped inside out when met with the slightest gust of wind. The reality is, when it rains back at home I stay inside and hibernate, but when you’re living abroad, there is way too much to explore. There’s no way you can just sit inside and watch Netflix all day when you just moved to Italy. Fortunately, my mom bought me a light, high-quality raincoat as a going away present before my study abroad trip to Australia. In the moment, I’ll admit I was a little disappointed. Flash forward five years and I still have that raincoat and I have used it all over the world. Whether trekking through the rainforests in Malaysia or sightseeing around the streets of Florence on a rainy day, this raincoat has proven to be one of my most important travel items. You’ll go on an infinite number of day trips and weekend-long adventures during your life abroad. Invest in a big, waterproof, well-made backpack. You’ll spend a couple hundred bucks, but this bag will become your new best friend while abroad. You’ll be able to go on weekend-long trips to Rome and not need to pay and check a bag. You can go on a daylong trek in South Korea and be able to comfortably pack plenty of snacks, water bottles, and extra clothes. Rest assured your friends with the little drawstring bags will constantly be asking to put things into your backpack — sure, this does get annoying but at least you were prepared! Unless you are 100% positive that you need a certain clothing item while you’re abroad, do not bring it. I’ve learned this lesson the hard way a million times over. If you don’t wear the clothing item religiously back at home, what makes you think that you’ll start wearing it abroad? You won’t. Similar to the toiletries, chances are you’ll be able to buy comparable clothing items abroad (and often for much cheaper). I packed a bunch of my fancy summer dresses when I moved to Vietnam. A week later, I realized how absolutely ridiculous I was for thinking I’d wear a short, strapless dress while wandering the crowded streets of Vietnam in 95-degree heat. Be realistic and make sure that you’re prepared for the weather in your new home. Chances are, you’ll be able to buy comparable brands and products abroad anyways for a cheaper price. I used to be very brand-loyal with my toiletries and would pack tons of extra bottles of hair products in my suitcase to make sure I never ran out. It took me a year to figure it out, but when moving abroad it’s best to stick with the local products and find one that you like. You’ll save a ton of space in your bags and a whole lot of money. First and foremost, toiletries are heavy. You are trying to fit your entire life into a couple of suitcases; you don’t have any space to spare on shampoo and shaving cream. I am a gym shoe junkie. I had a very hard time parting with a lot of my shoes prior to my move overseas. The reality is, you don’t need seven pairs of shoes to choose from.You need a couple pairs of high-quality shoes that you can walk around in for 10-hours straight and step in massive puddles without flinching.Shoes are really heavy, so follow the same rule as you did with the clothing. If you are unsure whether or not you need to bring them with, then chances are you don’t need them. Be realistic and put functionality above fashion. Be realistic. Be practical. If you absolutely cannot imagine your life without that one pair of running shoes or that cozy fleece zipup— bring it. If it's something you never use now, but you think overseas you might want it — leave it. If you don't use it now you aren't going to start using it all the sudden abroad. Editor bonus tips: Get a good night's sleep. Earplugs: If you don't get a good night's sleep, traveling gets exhausing really fast. Roosters, cows, local traffic, snoring roommates, the call to prayer, you name it! Bring a bunch and give them to your roommates (hostel mates) if you snore! Eye mask: Why? The light comes in your apartment or hotel room through the cracks at 4 am; your hotel sharing friends seem to have made a habit of coming back late and turning on the light to go to the bathroom; that overnight bus ride with the video blaring above your seat. You get the idea. Both of these items are cheap and light, you will seem like the smartest verteran traveler of your friends! An International TEFL Academy graduate who now works at ITA as an Advisor, Jessie is a Chicago native who began traveling in 2010 when she studied abroad in Gold Coast, Australia. Jessie graduated from The University of Iowa, and began her teaching and traveling adventures shortly thereafter in South Korea and then in Vietnam.